We took a short vacation to Las Vegas April 3-7 this year. Our predominant objectives were to visit Death Valley, dine at some great restaurants, and maybe attend a show. Unlike most Vegas vacationers we did not gamble. The flights were a pleasant surprise. We were upgraded to first class both directions and the flights were on time. Imagine that – usually only happens in your dreams. Our first meal was lunch on the patio at the Yard House. It’s in the shopping mall between the airport and the strip. They had hundreds of draft craft beers and great fish and chips. The beer and fish & chips were good. I’d stop there again. That night we ate at Triple George’s Steakhouse downtown right off the Fremont Experience. It more like an old San Francisco steakhouse than the glitzy restaurants on the strip. We really like it and dine there almost every Vegas Trip. Saturday evening we visited Jean Georges Steakhouse in the Aria before the Zakara show. First time there but won’t be our last. Really loved the food and the atmosphere. 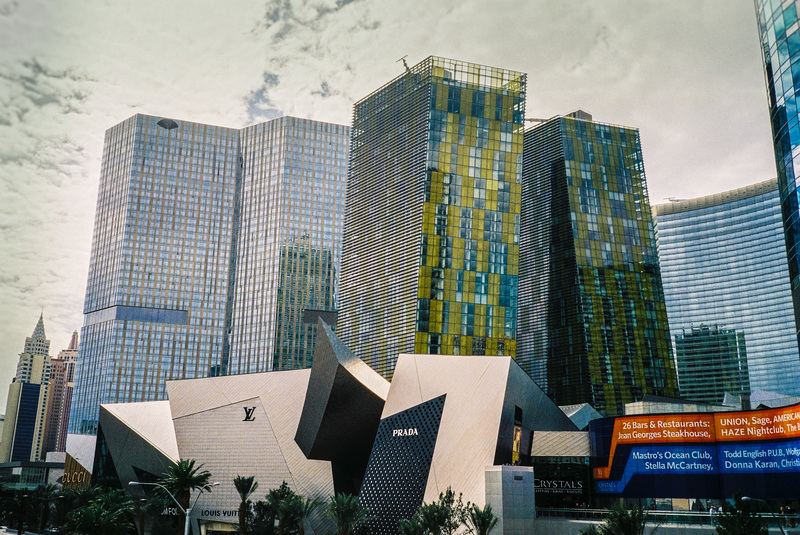 That’s the trouble with Vegas – so many great restaurants and so little time! Easter Sunday lunch was at The Inn at Furnace Creek which is a hotel on Death Valley’sedge. It was an Easter brunch and I can say for sure the best cuisine in 100 miles (the only cuisine for that matter except for the Death Valley golf course that is). Yes, Death Valley has a golf course, but that is another story for another time. After returning from the Valley we scrubbed the grime off and dined at Rao’s in Caesar’s Palace. It’s Italian and the daughter of Rao’s in Brooklyn. The best meal of the trip! Oh, I wish there were a great Italian Restaurant in Dallas. Our last night in Vegas we broke bread at Wynn’s Lakeside Grill. Its seafood. The food was excellent but the water show on the lake was better. On our way to the airport Tuesday morning we breakfasted at The Egg and I. I believe it’s a local chain but very good and it’s not on the Strip so you get to tour the regular Las Vegas on the drive to the restaurant. We did eat at some other establishments but if I don’t recommend them I don’t list them. We bunked at the Wyndham Grand Desert, our timeshare in Vegas. I’d describe it as mediocre compared to rooms on the strip. However, the Wyndham quarters are apartments with a full kitchen and a washer/dryer. For us the convenience of an apartment makes the Wyndham the best option for us. After being there I imagine exploring Death Valley is similar to traversing the far side of the Moon without a space suit and Sunshine. The terrain is literally out of this World. Death Valley is the largest National Park in the lower 48 States so its pretty nigh impossible to explore the entire park in one day but we tried our best. The Valley is about a two-hour drive Northwest of Las Vegas and is actually in California. 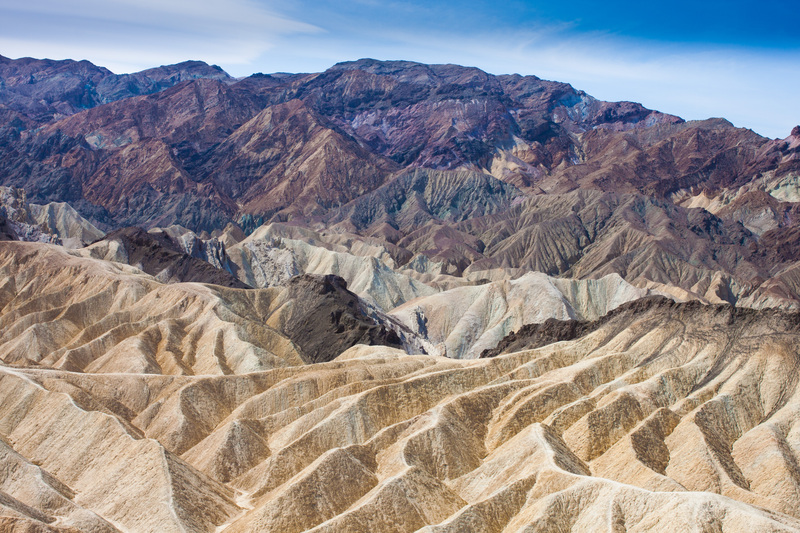 Our first stop was Zabriskie Point for both a scenic view of he valley and of the striking Kaleidoscope of colors in the surrounding hills. Upon arriving at the park we visited the Furnace Creek Visitor’s Center and then searched for a place to have lunch. Well, lunch was an extra bonus: the Easter Brunch at The Inn at Furnace Creek. This is a full service hotel at the edge of Death Valley. I’d like to return for a night someday. Then we drove towards Badwater Basin stopping first at the Salt Flat on the West Side Road. The name says it all – its flat with a top layer of salt. Next we stopped at the Devil’s Golf Course. The brochure relates only Lucifer himself could try for a par there, hence the name. 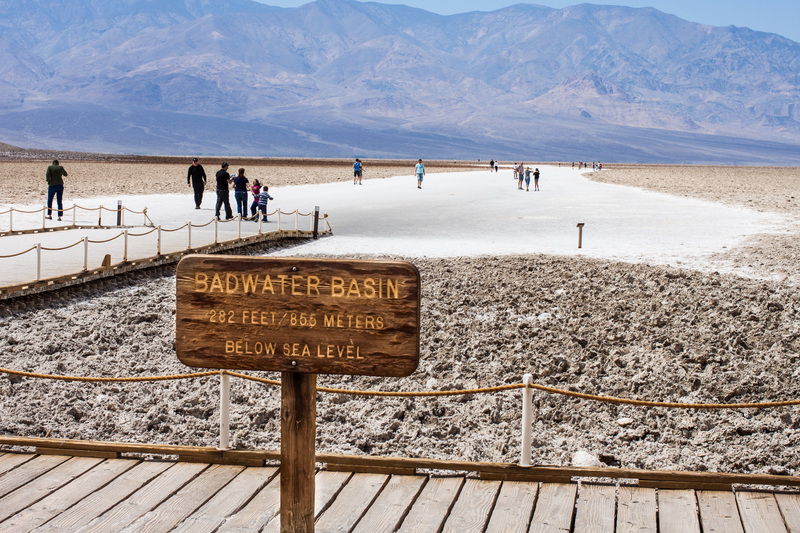 Badwater is the lowest place in the Western Hemisphere (292 feet below sea level). Once there you can gaze across the valley and see Telescope Peak which is 11,039 feet above sea level. The distance between the two is about 16 miles as the crow flies but approximately 24 miles if by foot. If your really crazy try the Badwater Ultramarathon from Badwater to Mt. Whitney (135 miles) staged in mid-July. After Badwater on our way out we detoured through Artist’s Drive winding though rock formations with many interesting pastel colors. 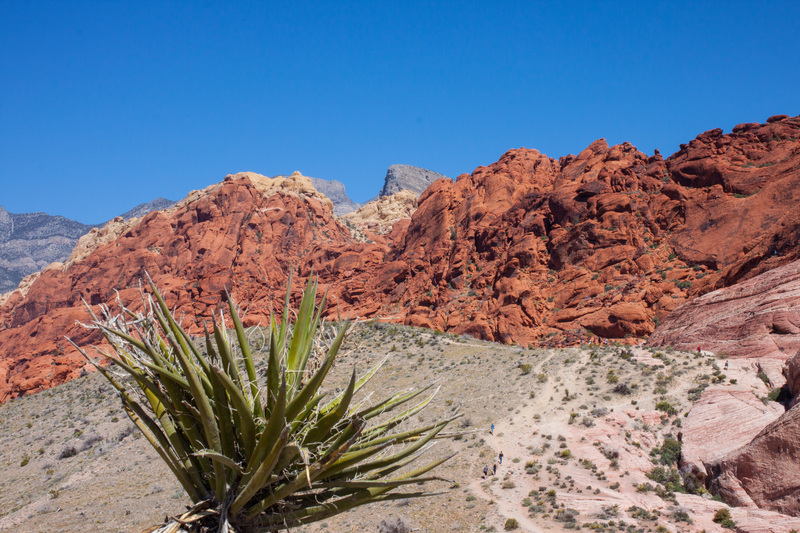 Red Rock Canyon is less than a half hour West of the City and is so named because of the striking red hills. You can just drive through the park but we stopped often and took short hikes through the desert and into the arroyos dotting the canyon. 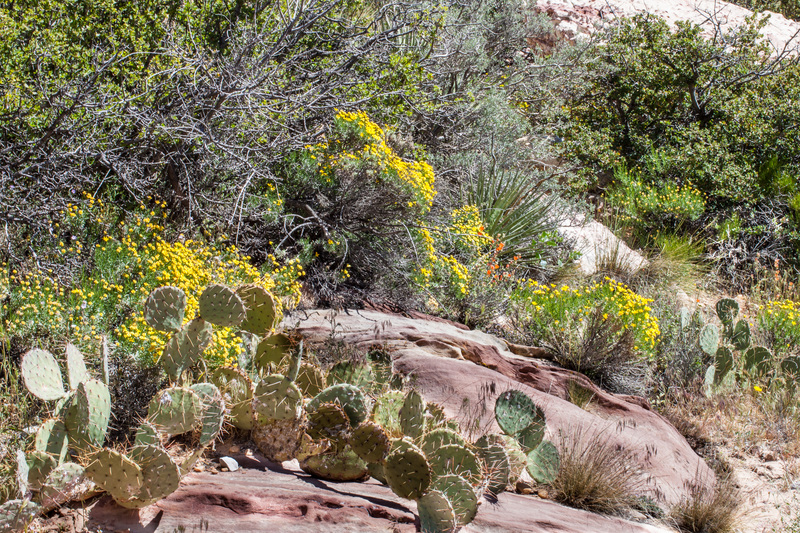 April is late in the Nevada Spring to view the desert in bloom. However, we were lucky the local fauna was in full bloom! Really enjoyed the experience. It’s a Cirque Du Soleil production. You either love their shows or you don’t. I happen to love them. Don’t try to make any sense or logic of the show just sit back and enjoy the experience. Take my advice and don’t bother. 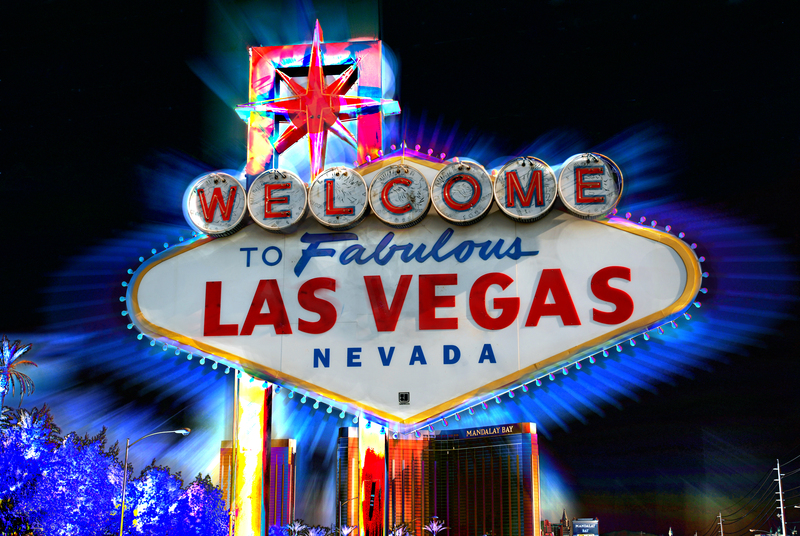 Years ago the Fremont Street light show was totally awesome! It happened every hour after dark. Crowds would actually stop gambling and rush from the casinos to watch and 6 minutes later after the light show ended they would file back into the casinos. This year resembled a preview of a dystopian future. Everything from old fat men in g-strings and combat boots playing electric violins to naked young girls with tattoos from head to toe roamed the streets. We were the odd men out so to speak because we were midwestern normal. This entry was posted on Friday, May 8th, 2015 at 12:39 am and is filed under Vacation. You can follow any responses to this entry through the RSS 2.0 feed. You can leave a response, or trackback from your own site.